When he was growing up in the small city of Sitapur in India’s northern Utter Pradesh region, Sanjeev Sinha’s parents instilled in him the importance of caring for and serving others. Later, when he became a medical student and resident at Sarojini Naidu Medical College in Agra, India, he was struck by the vast number of patients in his country who were suffering from pulmonary diseases, particularly tuberculosis. It was clear to him that focusing on pulmonary disease would be one of the best ways he could fulfil his desire to serve. Part researcher, part clinician and part educator, today, Sanjeev Sinha, MD, is a professor in the Department of Medicine at All India Institute of Medical Sciences (AIIMS), in New Delhi, India. In this role, he oversees the organization’s critical care services, bronchoscopy laboratory, tuberculosis and HIV drug resistant laboratory, as well as the infectious disease clinic. Currently, he is involved in several research projects on pulmonary tuberculosis, sleep disorder, and vitamin D levels in bronchoalveolar lavage (BAL) in tuberculosis and HIV patients. He also has an active research partnership with the University of California-Los Angeles (UCLA) that focuses on tuberculosis, HIV, and cancer and is looking for the prevalence of non-AIDS defining cancers in India such as lung cancer. 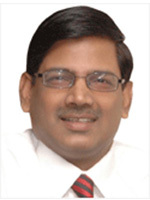 As a professor, Dr. Sinha is focused on creating a new educational environment at AIIMS that brings together graduate students, medical students, fellows, trainees, and faculty in shared education and research activities throughout the broad spectrum of clinical practice, teaching, and research at AIIMS. “Dr. Sinha is an eminent physician and an excellent researcher in pulmonary medicine and infectious diseases, and his leadership capability is beyond compare. What also makes him unique is his positive outlook towards basic research and its implication towards patient care,” says Dibyakanti Mondal, PhD, who is a research scientist and colleague of Dr. Sinha’s. After medical school and residency, Dr. Sinha received clinical training in internal medicine and pulmonary medicine at AIIMS. In 2003 he joined AIIMS as assistant professor of medicine in. Dr. Sinha is also closely associated with the Clinton Foundation, and a career highlight was when President Bill Clinton visited the AIIMS HIV/AIDS clinic in 2009. Another notable event happened in 2010, when he received the Membership Award for National Academy of Medical Sciences in New Delhi. “Dr. Sinha is a professional par excellence and offers professional advice that goes above the call of duty. This makes him a great leader among his professional colleagues,” says Shakti Kumar Gupta MBBS, MHA, who works with Dr. Sinha as Medical Superintendent at AIIMS. Dr. Sinha has been an ATS member for the past 10 years, and has travelled to the U.S. each year to attend the International Conference. He has also been involved in the assembly on sleep disorders for many years, volunteering in various capacities, including facilitator and scientific paper presenter. Another ATS group he is actively involved with is the ATS Global Scholars Program, where he serves as acting site ambassador for AIIMS. Today, Dr. Sinha spends much of his time persuading medical students, residents, and fellows to choose academic careers as physician scientists. He explains that in India there’s a critical shortage of physician scientists in many areas, including pulmonary medicine. He also works hard to promote the use of technology and leveraging it to help others. In his free time, he enjoys spending time with his wife, daughter and friends, and watching movies—one of his favorites is Vishwanath (in Hindi) and Spiderman (in English). He also enjoys vacationing and sightseeing with his family, a few of his favorite places to visit are Los Angeles, California, and Goa, India. He is an avid cricket and tennis fan.